Oxygen is one of the most commonly used therapeutic agents. Injudicious use of oxygen at high partial pressures (hyperoxia) for unproven indications, its known toxic potential, and the acknowledged roles of reactive oxygen species in tissue injury led to skepticism regarding its use. A large body of data indicates that hyperoxia exerts an extensive profile of physiologic and pharmacologic effects that improve tissue oxygenation, exert anti-inflammatory and antibacterial effects, and augment tissue repair mechanisms. These data set the rationale for the use of hyperoxia in a list of clinical conditions characterized by tissue hypoxia, infection, and consequential impaired tissue repair. Data on regional hemodynamic effects of hyperoxia and recent compelling evidence on its anti-inflammatory actions incited a surge of interest in the potential therapeutic effects of hyperoxia in myocardial revascularization and protection, in traumatic and nontraumatic ischemicanoxic brain insults, and in prevention of surgical site infections and in alleviation of septic and nonseptic local and systemic inflammatory responses. Although the margin of safety between effective and potentially toxic doses of oxygen is relatively narrow, the ability to carefully control its dose, meticulous adherence to currently accepted therapeutic protocols, and individually tailored treatment regimens make it a cost-effective safe drug. Oxygen is one of the most widely used therapeutic agents. It is a drug in the true sense of the word, with specific biochemical and physiologic actions, a distinct range of effective doses, and well-defined adverse effects at high doses. Oxygen is widely available and commonly prescribed by medical staff in a broad range of conditions to relieve or prevent tissue hypoxia. Although oxygen therapy remains a cornerstone of modern medical practice and although many aspects of its physiologic actions have already been elucidated, evidence-based data on its effects in many potentially relevant clinical conditions are lagging behind. The cost of a single use of oxygen is low. Yet in many hospitals, the annual expenditure on oxygen therapy exceeds those of most other high-profile therapeutic agents. The easy availability of oxygen lies beneath a lack of commercial interest in it and the paucity of funding of large-scale clinical studies on oxygen as a drug. Furthermore, the commonly accepted paradigm that links hyperoxia to enhanced oxidative stress and the relatively narrow margin of safety between its effective and toxic doses are additional barriers accounting for the disproportionately small number of high-quality studies on the clinical use of oxygen at higher-than-normal partial pressures (hyperoxia). Yet it is easy to meticulously control the dose of oxygen (the combination of its partial pressure and duration of exposure), in contrast to many other drugs, and therefore clinically significant manifestations of oxygen toxicity are uncommon. The present review summarizes physiologic and pathophysiologic principles on which oxygen therapy is based in clinical conditions characterized by impaired tissue oxygenation without arterial hypoxemia. Normobaric hyperoxia (normobaric oxygen, NBO) is applied via a wide variety of masks that allow delivery of inspired oxygen of 24% to 90%. Higher concentrations can be delivered via masks with reservoirs, tightly fitting continuous positive airway pressure-type masks, or during mechanical ventilation. There are two methods of administering oxygen at pressures higher than 0.1 MPa (1 atmosphere absolute, 1 ATA) (hyperbaric oxygen, HBO). 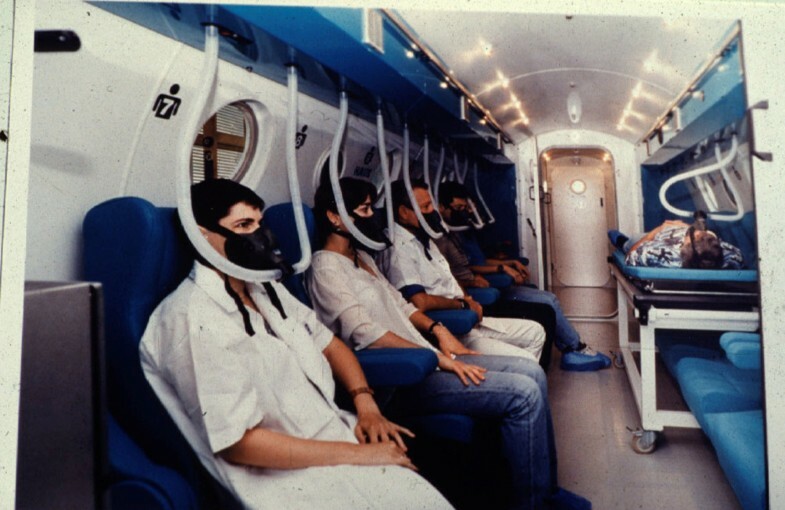 In the first, a small hyperbaric chamber, usually designed for a single occupant, is used. The chamber is filled with 100% oxygen, which is compressed to the pressure required for treatment. With the second method, the treatment is given in a large multiplace hyperbaric chamber. The chamber is filled with compressed air while the patients breathe 100% oxygen at the same ambient pressure via a mask or hood (Figure 1) . A multiplace walk-in hyperbaric chamber. The treatment pressure is attained by compressing the ambient air in the chamber. Patients are exposed to oxygen or other gas mixtures at the same pressure via masks or hoods. Many hyperbaric facilities are equipped for providing a full-scale critical care environment, including mechanical ventilation and state-of-the-art monitoring. Delivery of oxygen to tissues depends on adequate ventilation, gas exchange, and circulatory distribution. When air is breathed at normal atmospheric pressure, most of the oxygen is bound to hemoglobin while only very little is transported dissolved in the plasma. On exposure to hyperoxia, hemoglobin is completely saturated with oxygen. This accounts for only a small increase in arterial blood oxygen content. In addition, the amount of physically dissolved oxygen in the blood also increases in direct proportion to the ambient oxygen partial pressure. Due to the low solubility of oxygen in blood, the amount of dissolved oxygen in arterial blood attainable during normobaric exposures to 100% oxygen (about 2 vol%) can provide only one third of resting tissue oxygen requirements. However, on exposure to oxygen at a pressure of three atmospheres (in a hyperbaric chamber), there is sufficient oxygen dissolved in the plasma (about 6 vol%) to meet the average requirements of resting tissues by means of dissolved oxygen alone without contribution from oxygen bound to hemoglobin [1, 2]. This is part of the rationale behind the use of hyperoxia in situations in which the hemoglobin's oxygen-carrying capacity has been impaired (for example, in carbon monoxide poisoning  and in severe anemia when transfusion of blood is not possible ). Deliberations on the effect of hyperoxia on the availability of molecular oxygen to tissues which are based on changes in arterial blood oxygen content undervalue the main effect of hyperoxia that is related to changes in its partial pressure in the blood (Table 1). The flow of oxygen into tissues occurs by diffusion. The driving force for diffusion of oxygen is determined by its partial pressure gradient between capillary blood and tissue cells and much less so by increased oxygen content . Inhalation of 100% oxygen yields a 5- to 7-fold increase in arterial blood oxygen tension at normal atmospheric pressure and may reach values close to 2,000 mm Hg during hyperbaric exposure to oxygen at 0.3 MPa (3 ATA). The marked increase in oxygen tension gradient from the blood to metabolizing cells is a key mechanism by which hyperoxygenation of arterial blood can improve effective cellular oxygenation even at low rates of tissue blood flow. ATA, atmosphere absolute; PAO2, alveolar oxygen partial pressure. A recent surge of interest in the value of increasing the availability of oxygen to tissues in critical conditions yielded important studies like the one on early goal-directed therapy in sepsis  that assessed a resuscitation protocol aimed at increasing tissue oxygenation. Regrettably, the specific value of oxygen therapy was not assessed in this study. Yet a recent study that compared the influence of allogeneic red blood cell transfusion with 100% oxygen ventilation in volume-resuscitated anemic patients after cardiac surgery demonstrated a superior effect of normobaric hyperoxia (NBO) on tissue (skeletal muscle) oxygen tension . The availability of oxygen to tissues is also determined by its effects on hemodynamic variables. In healthy animals and humans, oxygen causes a temporary increase in blood pressure by increasing total peripheral vascular resistance secondary to systemic peripheral vasoconstriction . This transient change is rapidly counterbalanced by a decrease in heart rate and cardiac output that prevents a sustained effect on arterial blood pressure . The unique combination of hyperoxia-induced vasoconstriction and high blood oxygen tension affords an advantage by decreasing a vasogenic component of increased tissue hydrostatic pressure while preserving a high blood-to-tissue oxygen partial pressure gradient and is therefore considered beneficial in crush injury and compartment syndrome  as well as brain edema, particularly when the latter develops in situations in which additional indications for HBO therapy exist, such as carbon monoxide poisoning and air embolism . Recent experimental evidence supports the role of hyperoxia in cerebral ischemic-anoxic insults such as stroke, head injury, near drowning, asphyxia, and cardiac arrest . In the specific case of traumatic brain injury, it has repeatedly been shown that, although HBO causes cerebral vasoconstriction, it increases brain tissue pO2 (partial pressure of oxygen) and restores mitochondrial redox potential [11, 12]. NBO has also been shown to decrease intracranial pressure and improve indices of brain oxidative metabolism in patients with severe head injury . A significant body of experimental data that suggested beneficial effects of hyperoxia in ischemic stroke was followed by clinical trials [14–16] that failed to demonstrate clear-cut benefits. Yet significant shortcomings of the available clinical data call for re-evaluation of the effect of hyperoxia on the outcome of stroke and on the possibility to use it to extend the narrow therapeutic time window for stroke thrombolysis . Another area of controversy is the use of NBO in asphyxiated newborn infants. Initial laboratory and clinical studies suggested an inferior effect of resuscitation with 100% oxygen compared with room air [18, 19]. Later cumulative clinical experience [20, 21] and systematic review of the literature  have not indicated a significant difference in the effectiveness of either gas source or in the final outcome in this specific group of patients. Yet a recent systematic review and meta-analysis of the few available randomized or quasirandomized studies of depressed newborn infants have shown a significant reduction in the risk of mortality and a trend toward a reduction in the risk of severe hypoxic ischemic encephalopathy in newborns resuscitated with 21% oxygen . Taken together, the available data definitely do not support an overall beneficial effect of hyperoxia in this condition, although the superiority of room air in neonatal resuscitation may still be regarded as controversial. In contrast to the knowledge on the effects of hyperoxia on central hemodynamics, much less is known about its effects on regional hemodynamics and microhemodynamics. Studies that looked at hyperoxia-induced changes in regional hemodynamics in healthy animals both in normal atmospheric pressure [24–30] and in hyperbaric conditions [24–26, 28, 31, 32] yielded conflicting results, indicating an increase, a decrease, or no change in regional blood flows to specific vascular beds. Only limited and scattered information on regional hemodynamic effects of hyperoxia in relevant models of disease is available. In this regard, a study in an acute canine model of ischemia and reperfusion (IR) of the external iliac artery showed that HBO did not induce vasoconstriction in the affected regional vascular bed until oxygen deficit was corrected . Such findings support suggestions that a dynamic situation may exist in which vasoconstriction is not always effective in severely hypoxic tissues and therefore may not limit the availability of oxygen during hyperoxic exposures and that hyperoxic vaso-constriction may resume after correction of the regional hypoxia. Furthermore, in a severe rat model of hemorrhagic shock, we have shown that normobaric hyperoxia increased vascular resistance in skeletal muscle and did not change splanchnic and renal regional resistances. This yielded redistribution of blood flow to the small intestine and kidneys 'at the expense' of skeletal muscle . A similar divergent effect of normobaric hyperoxia that augmented hind-quarter vascular resistance without a significant effect on the superior mesenteric bed was also found in a rat model of splanchnic IR . In this regard, NBO-induced redistribution of cardiac output to the hepatosplanchnic regions was recently reported in a pig model of severe sepsis . NBO was also shown to redistribute blood flow to ischemic myocardium and improve contractile function during low-flow myocardial ischemia . So the claim that hyperoxia is a universal vasoconstrictor in all vascular beds is an oversimplification both in normal and pathologic states. Furthermore, understanding of the effects of hyperoxia on regional hemodynamics cannot be based on simple extrapolations from healthy humans and animals and warrants careful evaluation in selected clinical states and their animal models. Tissue hypoxia activates a large variety of vascular and inflammatory mediators that trigger local inflammation  and may lead to a systemic inflammatory response (SIR) that in many cases culminates in multiple organ dysfunction and multiple organ failure (MOF) [39, 40]. The wish to prevent or treat hypoxia-induced inflammatory responses yielded studies that evaluated the effects of hyperoxia on the microvascular-inflammatory response. Most of the attention focused on models of IR which frequently provoke local inflammatory response, SIR, and MOF . The potential beneficial effects of hyperoxia are confronted by the understanding of the central role of reactive oxygen species (ROS) in IR injury [40–42]. The demonstration of increased production of ROS during exposure of normal tissues to hyperoxia evoked concerns that oxygen therapy could exacerbate IR injury. The seemingly rational unease related to the use of hyperoxia in IR must be weighed against a gradually growing body of evidence on beneficial effects of hyperoxia in diverse IR models . Hyperoxia appears to exert a simultaneous effect on a number of steps in the proinflammatory cascades after IR, including interference with polymorphonuclear leukocyte (PMNL) adhesion and production of ROS. In this regard, HBO has been shown to decrease rolling and adhesion of PMNL in the microcirculation following IR of skeletal muscle [43, 44], small bowel [35, 45], skin flaps , heart [47, 48], and liver [49, 50] as well as after carbon monoxide poisoning . It has been demonstrated by Thom  that HBO inhibits PMNL adherence mediated by β2 integrin glycoproteins CD11/CD18 by impairing cGMP (cyclic guanosine monophosphate) synthesis in activated leukocytes . Hyperoxia also reduces the expression of the endothelial adhesion molecules E-selectin [53, 54] and ICAM-1 (intracellular adhesion molecule-1) [42, 52]. Hyperoxia is known to affect the production of nitric oxide (NO) mostly by inducing eNOS (endothelial NO synthase) protein production . Increased NO levels may inhibit PMNL adhesion by inhibition of CD18 function and downregulation of endothelial adhesion molecule synthesis [55, 56]. Furthermore, it has been shown in ischemic skin flaps that hyperoxia increases local endothelial surface superoxide dismutase activity . This action may diminish the more distal proinflammatory events initiated by ROS after IR, and indeed HBO has been shown to decrease lipid peroxidation and oxidative stress in a number of IR models [49, 51, 57, 58]. HBO was also shown to exert beneficial effects in other inflammatory conditions, including experimental colitis [59, 60], Crohn disease , carrageenan-induced paw edema , and zymossan-induced SIR [63, 64]. Detailed mechanisms of the salutary effects of hyperoxia in some of these conditions have not yet been fully elucidated. In addition to a predominant hyperacute proinflammatory response orchestrated mostly by its effects on PMNLs and macrophages, tissue hypoxia has been shown to provoke subsequent anti-inflammatory responses in macrophages [65–68], to downregulate proinflammatory anti-bacterial functions of T cells via augmented HIF-1a (hypoxia inducible factor-1a) activity , and to weaken local hypoxia-driven and adenosine A2A receptor-mediated pulmonary anti-inflammatory mechanisms . These observations may represent important subacute effects of hypoxia that help to harness an initial powerful and potentially destructive proinflammatory effect, may be a part of tissue repair processes, or may be an important component of a hypoinflammatory response manifested by some patients with sepsis and acute respiratory distress syndrome (ARDS). All in all, the ameliorating effects of hyperoxia on the acute net proinflammatory response after IR and other conditions may be related to direct inhibitory effects of oxygen on mechanisms that enhance PMNL rolling, adhesion, activation, and transmigration to tissues. Hyperoxia may also exert indirect effects on the inflammatory response simply by ameliorating tissue hypoxia – a key trigger of inflammation . The effects of hyperoxia on subsequent stages of tissue responses to hypoxia and especially on the anti-inflammatory arm of that response await clarification. Sepsis is one of the most common clinical causes of SIR. In a study of early hyperdynamic porcine septic shock, Barth and colleagues  demonstrated beneficial effects of NBO on apoptosis in the liver and the lungs, on metabolic acidosis, and on renal function. We found a dose-related beneficial effect of NBO (100% oxygen for 6 hours per day) on the pulmonary inflammatory response in sepsis induced by cecal ligation and puncture (CLP) in rats . Buras and colleagues  studied the effects of hyperoxia at 1, 2.5, and 3 ATA applied for 1.5 hours twice a day on survival in a mouse CLP model of sepsis and reported that HBO at 2.5 ATA improved survival. They also presented data suggesting that augmented production of the anti-inflammatory cytokine interleukin-10 may be an important mechanism of the salutary effects of HBO in this model . The steadily growing body of data on beneficial effects of hyperoxia in severe local and systemic inflammation warrants appropriate clinical studies to define its role as a clinically relevant modifier of hyperinflammation. HBO has been studied and used in a large variety of infections for over 40 years. Early demonstrations of its beneficial effects in clostridial myonecrosis (gas gangrene)  and in chronic refractory osteomyelitis  were followed by a large body of experimental data on in vitro effects of increased ambient oxygen partial pressures on microorganisms and reports on in vivo effects of HBO in infection [75, 76]. HBO exerts direct bacteriostatic and bactericidal effects mostly on anaerobic microorganisms. These effects have been attributed to deficient defense mechanisms of anaerobic microorganisms against increased production of ROS in hyperoxic environments. Beyond a direct activity against microorganisms, HBO has been shown to re-establish defense mechanisms that are critically impaired by the typically hypoxic microenvironment in infectious sites . Both phagocytosis and microbial killing by PMNLs are severely impaired in hypoxic environments. By increasing tissue oxygen tensions, HBO therapy restores phagocytosis and augments the oxidative burst that is needed for leukocyte microbial killing. Furthermore, the activity of a number of antibiotics is impaired in hypoxic environments and is restored and even augmented during exposure to HBO. Other important beneficial effects of hyperoxia in infection are attributed to enhancement of key components of tissue repair such as necrotic tissue proteolysis, fibroblast proliferation, collagen deposition and angiogenesis, migration of epithelial cells, and bone remodeling by osteoblastic/osteoclastic activity, which are all severely impaired in hypoxic tissues . Altogether, direct activity on bacteria (for example, pseudomonas, some strains of Escherichia, and Clostridium perfringens), improvement of cellular defense mechanisms, synergistic effects on antibiotic activity, modulation of the immune response, and augmentation of mechanisms of tissue repair form the basis for the use of HBO as adjunctive therapy in combination with antibiotics and surgery for treating tissue infections involving both anaerobic and aerobic microorganisms in hypoxic wounds and tissues [75–78] and in sepsis-induced SIR . As for normobaric hyperoxia, two recent prospective randomized clinical studies reported significant beneficial effects of perioperative administration of supplemental oxygen (80% oxygen at normal atmospheric pressure) on surgical site infection (SSI) after elective colorectal surgery [80, 81]. A third study  on patients undergoing various open abdominal procedures reported a higher incidence of SSI in the higher oxygen group and ignited a yet unsettled debate on the routine use of normobaric hyperoxia to prevent SSI. Hyperoxia has also been shown to inhibit the growth of some fungi [83–85] and to potentiate the antifungal effect of amphthericin B . Data from case reports, small groups of patients, and compilations of previous reports support the use of adjunctive HBO treatment together with amphotericin B and surgery in invasive rhinocerebral mucormycosis [85–87]. The level of evidence on the effects of HBO in other fungal infections is less compelling. The proven pathophysiologic profile of actions of hyperoxia set the basis for its use in selected clinical conditions. Sufficient clinical evidence is available for the use of HBO in carbon monoxide poisoning, decompression sickness, arterial gas embolism, radiation-induced tissue injury, clostridial myo-necrosis, problem wounds, crush injury, and refractory osteomyelitis . Effects of NBO in these and in other potentially relevant clinical states are much less studied. Studies that evaluate a range of oxygen doses in both the normobaric and hyperbaric pressure range are largely unavailable and should be encouraged by appropriate allocation of research funding. The major limitation confronting a much more liberal clinical use of hyperoxia is its potential toxicity and the relatively narrow margin of safety that exists between its effective and toxic doses. However, an awareness of the toxic effects of oxygen and an acquaintance with safe pressure and duration limits of its application, combined with the ability to carefully manage its dose, provide an acceptable basis for expanding the current list of clinical indications for its use. The most obvious toxic manifestations of oxygen are those exerted on the respiratory system and central nervous system (CNS) . Oxygen toxicity is believed to result from the formation of ROS in excess of the quantity that can be detoxified by the available antioxidant systems in the tissues. Although mechanisms of free radical damage to a substantial array of cellular systems (proteins, enzymes, membrane lipids, and nucleic acids) have already been characterized [88–90], large gaps exist in our understanding of the intermediate stages in the pathophysiologic cascades that follow such reactions and result in functional deficits and clinical phenomena. The lungs are exposed to higher oxygen tensions than any other organ. At exposures to ambient oxygen pressures of up to 0.1 MPa (1 ATA), the lungs are the first organ to respond adversely to the toxic effects of oxygen. The response involves the entire respiratory tract, including the airway epithelium, microcirculation, alveolar septa, and pleural space. Pulmonary oxygen toxicity is characterized by an initial period in which no overt clinical manifestations of toxicity can be detected – termed the 'latent period'. The duration of this 'silent' clinical interval is inversely proportional to the level of inspired oxygen [90, 91]. Acute tracheobronchitis is the earliest clinical syndrome that results from the toxic effects of oxygen on the respiratory system. It does not develop in humans breathing oxygen at partial pressures of below 0.05 MPa (0.5 ATA or 50% oxygen at normal atmospheric pressure). In healthy humans breathing more than 95% oxygen at normal atmospheric pressure (0.1 MPa), tracheobronchitis develops after a latent period of 4 to 22 hours and may occur as early as 3 hours while breathing oxygen at 0.3 MPa (3 ATA) [90, 92, 93]. It can start as a mild tickling sensation, later followed by substernal distress and inspiratory pain, which may be accompanied by cough and, when more severe, by a constant retrosternal burning sensation. Tenacious tracheal secretions may accumulate. Upon termination of hyperoxic exposure, the symptoms subside within a few hours, with complete resolution within a few days [90, 92, 93]. Longer exposures to oxygen (usually more than 48 hours at 0.1 MPa) may induce diffuse alveolar damage (DAD). The clinical symptoms as well as the laboratory, imaging, and pathologic findings of oxygen-induced DAD are not significantly different from those of ARDS from other causes . Resolution of the acute phase of pulmonary oxygen toxicity or prolonged exposures to oxygen at sublethal concentrations such as during prolonged hyperoxic mechanical ventilation may result in a chronic pulmonary disease characterized by marked residual pulmonary fibrosis and emphysema with tachypnea and progressive hypoxemia [94, 95]. The relative contributions of hyperoxia, the underlying clinical condition, and mechanical ventilation to the occurrence of chronic pulmonary fibrosis and emphysema in human adults have yet to be clarified. CNS oxygen toxicity occurs in humans at much higher oxygen pressures, above 0.18 MPa (1.8 ATA) in water and above 0.28 MPa (2.8 ATA) in dry exposures in a hyperbaric chamber. Hence, CNS toxicity does not occur during normobaric exposures but is the main limitation for the use of HBO in diving and hyperbaric treatments. The 'latent' duration until the appearance of symptoms of CNS oxygen toxicity is inversely related to the oxygen pressure. It may last for more than 4 hours at 0.17 to 0.18 MPa and may be as short as 10 minutes at 0.4 to 0.5 MPa. The most dramatic manifestation of CNS oxygen toxicity is a generalized tonic-clonic (grand mal) seizure . Hyperoxia-induced seizures are believed to be reversible, causing no residual neurologic damage and disappearing upon reduction of the inspired oxygen partial pressure [7, 96]. Early abnormal changes in cortical electrical activity were reportedly seen on exposure to HBO a few minutes prior to the full development of the electrical discharges . Unfortunately, no real-time on-line definition of the preseizure electroencephalogram (EEG) activity which could serve as an early EEG indicator of CNS oxygen toxicity is available . Other symptoms of CNS toxicity include nausea, dizziness, sensation of abnormality, headache, disorientation, light-headedness, and apprehension as well as blurred vision, tunnel vision, tinnitus, respiratory disturbances, eye twitching, and twitching of lips, mouth, and forehead. CNS toxicity does not appear to have warning signs as there is no consistency in the pattern of appearance of symptoms and no typical gradual sequence of minor signs appearing prior to the full development of the seizures . The most dramatic personal factor that may modify the sensitivity to CNS oxygen toxicity is an increase in blood pCO2 (partial pressure of carbon dioxide) [99, 100]. Hypercapnia occurs in patients due to hypoventilation, chronic lung diseases, effects of analgesics, narcotics, other drugs, and anesthesia and should be taken into consideration in designing individual hyperoxic treatment protocols. Various pharmacologic strategies were tested in animal models for postponing hyperoxic-induced seizures. However, none of them has shown clinically relevant efficacy . Reversible myopia is a relatively common manifestation of the toxic effects of HBO on the lens . Cataract formation has been reported after numerous HBO sessions and is not a real threat during standard protocols. Other possible side effects of hyperbaric therapy are related to barotraumas of the middle ear, sinuses, teeth, or lungs which may result from rapid changes in ambient hydrostatic pressures that occur during the initiation and termination of treatment sessions in a hyperbaric chamber. Proper training of patients and careful adherence to operating instructions decrease the incidence and severity of hyperbaric chamber-related barotraumas to an acceptable minimum. Due to its potential toxic effects, HBO is currently restricted to short sessions (less than 2 hours), at pressures below the threshold of CNS toxicity (0.28 MPa), with 'recovery' breaks of few minutes during which the patient is switched to air breathing at the treatment pressure . As for NBO, whenever possible, it should be restricted to periods shorter than the latent period for development of pulmonary toxicity. When used according to currently employed standard protocols, oxygen therapy is extremely safe. This review summarizes the unique profile of physiologic and pharmacologic actions of oxygen that set the basis for its use in human diseases. In contrast to a steadily growing body of mechanistic data on hyperoxia, the accumulation of high-quality information on its clinical effects lags behind. The current list of evidence-based indications for hyperoxia is much narrower than the wide spectrum of clinical conditions characterized by impaired delivery of oxygen, cellular hypoxia, tissue edema, inflammation, infection, or their combination that could potentially be alleviated by oxygen therapy. Furthermore, most of the available reasonably substantiated clinical data on hyperoxia originate from studies on HBO which usually did not control for the effects of NBO. The easy availability of normobaric hyperoxia calls for a much more vigorous attempt to characterize its potential clinical efficacy. The multifaceted beneficial profile of actions of hyperoxia warrants an appropriately funded traditional pharmacologic research approach that will determine the efficacy of a range of safe nontoxic doses (combinations of partial pressure and duration) of hyperoxia in a prospective blinded fashion. This article is part of a review series on Gaseous mediators, edited by Peter Radermacher.